Black students actively listening to a presentation at a BSU event. The Black Student Union is the largest primarily black student organization with about 105 active members. 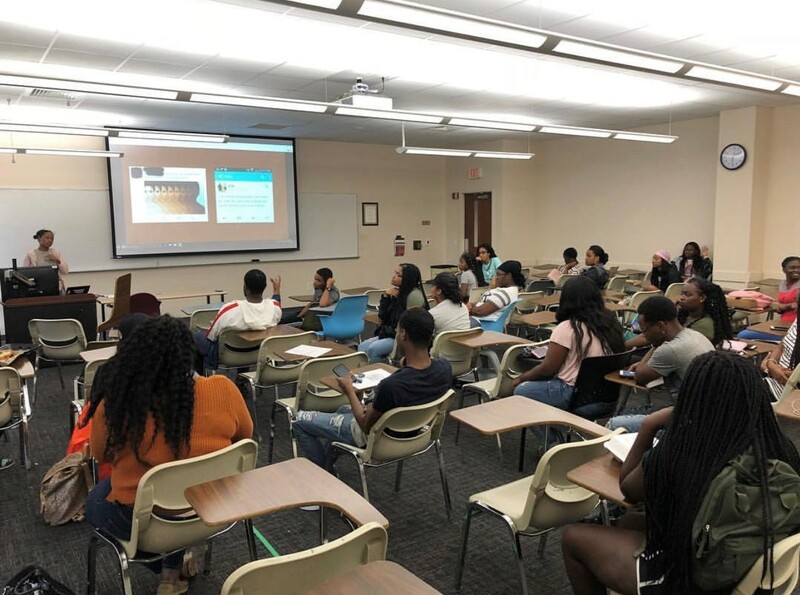 Several black UCF students had different interpretations about their experiences learning at the university while acknowledging that they are one of the minority groups here. While UCF houses a very diverse population of students, the black community only represents 11% of the UCF population, according to the UCF facts page from 2018 to 2019. Over 50 percent of UCF’s student population is white, which designates UCF as a primarily white institution. Senior nursing major Ghislaine Edmond says that there aren’t many students that look like her in her program. Junior psychology major Adreana Jones says that she “feels like a guest” at the university. She also says some of the difficulties of being black at UCF stem from the black community itself. Even though black students are not a majority on campus, they are represented through several different clubs and organizations. One of the largest primarily black student organizations on campus is the Black Student Union. The Black Student Union was founded on Oct. 29, 1969. It currently has about 105 active members this semester, according to its Co-Marketing Director Oteisha Barrett. They hold general body meetings every other Wednesday in the Student Union and their major events include convocation every fall and spring semester, the Mister and Misses BSU pageant and the Greek stroll off. The stroll off is an event where different black Greek sorority’s and fraternities compete to see who has the best “stroll” or step routine. Even though black students may not get to see or interact with each other that much on campus, outside of campus is where the black community thrives the most. This interaction happens through social media outlets and parties thrown by black promoters, according to some black students. “I think the black population makes itself known on social media,” Jones said.